I got introduced to pho when a Vietnamese restaurant opened a few blocks from my home a few months ago. I found this dish so comforting that lately, it’s been a staple in my diet. My dear friend Lar taught me how to prepare this comfort food at home. And let me tell ya, it’s perfect for a get-together among friends or family. 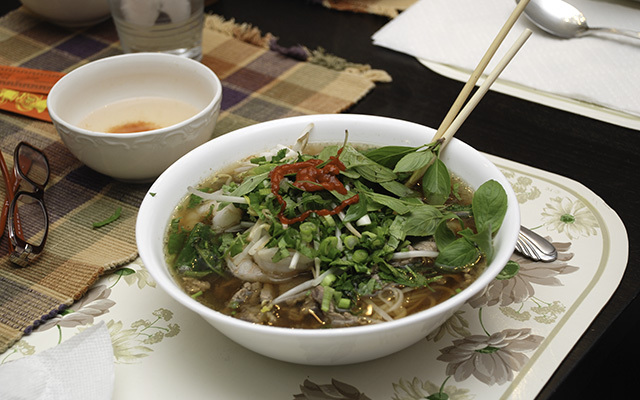 All you need to do is make the stock ahead of time and prepare the fixins so that your guests can build their own pho. I’ll guide you on what you need so you can give it a try in your own homes. 1. Combine soup bone and water in a large stockpot. 2. Bring to a boil. If foam starts to rise, skim it off. 3. Partially cover and simmer for about 2 to 3 hours. If you want to keep it lean, prepare the day before. Refrigerate overnight and when you’re ready to use, skim any hardened fat from the surface before putting it back on the stove to reheat. (The soup bones I use are so lean, I barely get any fat at all.) You can keep the beef stock in the fridge for 4 to 5 days. Now, when you go to the meat market and ask for soup bones and get ‘dog bones’ instead, don’t wreak havoc. They’re the same thing. Of course, it won’t hurt to verify with the meat market person. A few minutes before the party, you can prep the fixins. I have fixin suggestions to make either a beef pho or a seafood pho … or a combined beef-seafood pho. It’s a really flexible dish! 1. Keep the beef stock simmering. Add sugar, soy sauce, and fish sauce to taste. Add the onion slices. 2. Soak the rice stick in warm water for 5 to 8 minutes or until softened. 3. Cook the beef in a colander submerged in the stock just until it changes color. Transfer on a serving plate. 4. Arrange the basil, cilantro, spring onions, bean sprouts, and lime wedges on a large platter. 5. Arrange the condiments, platter of fixins, and various meats on the dining table. Time for the party! Soak the rice sticks for each serving in boling water for a few seconds. We like to use 2-quarts serving bowls as soup bowls. Transfer the rice sticks in the bowl and pour 2 or 3 ladles of beef stock over it. Let each person assemble his own pho, according to his liking. Then eat with chopsticks, slurping is encouraged! Lar, and her husband Dave, introduced me to Moscato. My favorite, so far, is the Gallo. Pho and Moscato with great friends – good times!